Earlier this week, we were having a laugh around the Kotaku campfire at The Onion's latest video-game sendup: 'Fully Leveled-Up Video Game Character Marvels At How Far He's Come.' These guys are pretty damned good at poking fun at video games, and they've been at it for ages. Why not pull together our favorite stories from over the years? So that's what we did. 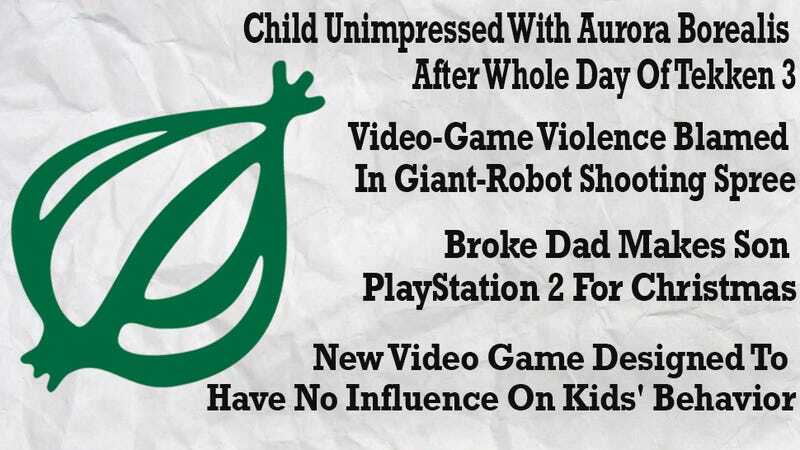 Here are our favorite Onion video game stories, from Tekken 3 all the way up to the Xbox One. Exacerbating the situation, Mario said, is the seemingly arbitrary placement of the hazards. "I could see why, if you're in a factory, you might find yourself jumping around on dangerous conveyor belts moving in different directions," he said. "But why would you have conveyor belts in a castle? Or in the middle of a forest? Nintendo and these other companies are always talking about how realistic their graphics are. Well, what's so realistic about killer turtles shooting out of clouds and such?" Added Mario: "It's-a me, Mario!" According to Rich Koslow, editor of GamePro magazine, Beltway Sniper: Silent Strike was expected to be one of the hottest video-game releases of the holiday season. Available for Nintendo Gamecube, PlayStation 2, Xbox, and PC, the game enables players to wander through an ultra-realistic suburban D.C. landscape shooting innocent passersby. "Beltway Sniper is everything you've heard and more," Koslow said. "I recently had a chance to play it myself at Pixxel's offices, and it's as close as you can come to real-life experience short of actually being Muhammad or Malvo himself." Despite the strong buzz surrounding the game, Conway said Pixxel Arts is committed to holding off releasing Beltway Sniper "until the wounds from the tragedy have begun to heal." He stressed that the delay has nothing to do with any problems with the game itself. "Is this all there is?" asked Snake, hiding in a storage locker while two masked guards searched for him in the hold of a cargo ship. "Is this why I was created? To suffer? Will I ever escape this endless loop of grueling labor followed by violent death?" Snake was then discovered by the guards and cut down in a hail of gunfire. Tekken 3, which Meier-household sources estimate Kenny plays 30 to 35 hours per week, was created by Namco exclusively for the PlayStation and features 28 different fully rendered combatants, compared to the Northern Lights' zero. In addition, Tekken 3 allows players to do battle in a wide range of exotic background settings, easily surpassing the aurora, which offers only one choice of background graphic, the relatively unimpressive "Night Mode." A demo version of Stacker was unveiled at the Tokyo Game Show in September and garnered praise from parents' groups who lauded its unstimulating visuals, utter lack of storyline, and non-immersive game play. "After playing Stacker, there is absolutely no reason for anyone to want to take boxes, crates, or any other polygonal object, and place them atop one another, as seen in this gem of a game," said Laura Keitel of the D.C.-based Center For Entertainment And The Family. "No kid in the world could possibly get anything out of it. There's no reason why the video-game industry shouldn't be making a lot more games like this." "I can't wait to see the look on Andy's face when he unwraps this," said McManus, lovingly painting a "2" onto the front of the handmade video-game console. "I didn't get to sand the controllers as smoothly as I'd have liked, but still." "After weeks of fighting for every pixel of ground and seeing 180 degrees of carnage in every direction, you start to wonder if it's really worth it," said 23-year-old Avers, who has been decorated 1,327 times since 1995, when he began fighting on his Sega Genesis. "I've already given my life several dozen times in this endless, senseless war game." Avers added: "Some nights, it's all I can do to 'continue.'" "For too long, game designers have been creatively stymied by a mammary-imaging technology only capable of rendering one type of breast—a heaving pair of massive, gravity-defying, torpedo-shaped bosoms," said Warren Hood, developer of the new Vex9 graphics card, which has finally enabled video game wire-frame artists to digitally sculpt breasts as small as B-cups. "At long last, we can give die-hard gamers the level of realism they've been looking for." Witnesses said the robot, who was experiencing failing grades in the Arena and was said to be several thousand credits in debt, appeared to be under "great strain" at the time of the multiple robocide. The robot, one witness said, displayed an "almost mechanical lack of emotion" during the four-and-a-half-minute shooting spree, gunning down his fellow robots, as well as several fortified laser-gun stations and a number of unmanned drones, with "inhuman" precision. "He was like a machine, programmed to kill without hesitation or remorse," said DTD-35667C, a 44-year-old robot injured in the attack. There are many more, but those are our favorites. If you've got any of your own favorites that you'd like to add, please do so in the comments. And to our sarcasm-slinging brethren and sistren at The Onion: We salute you.